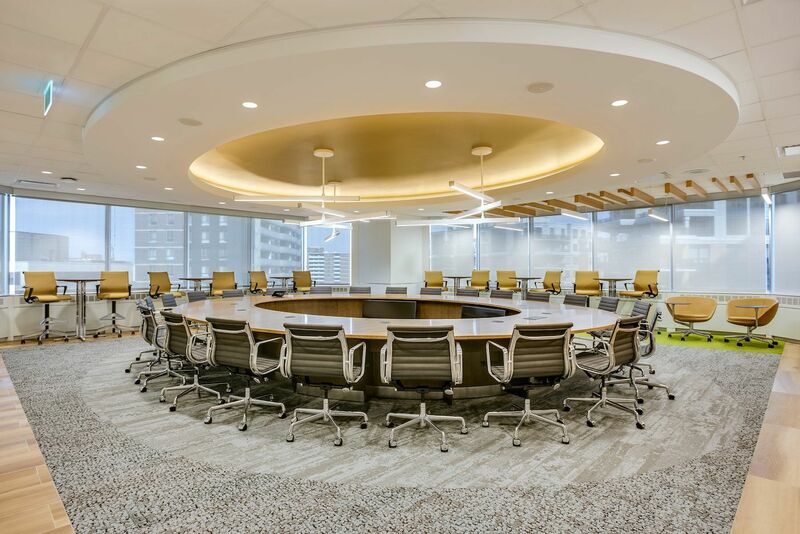 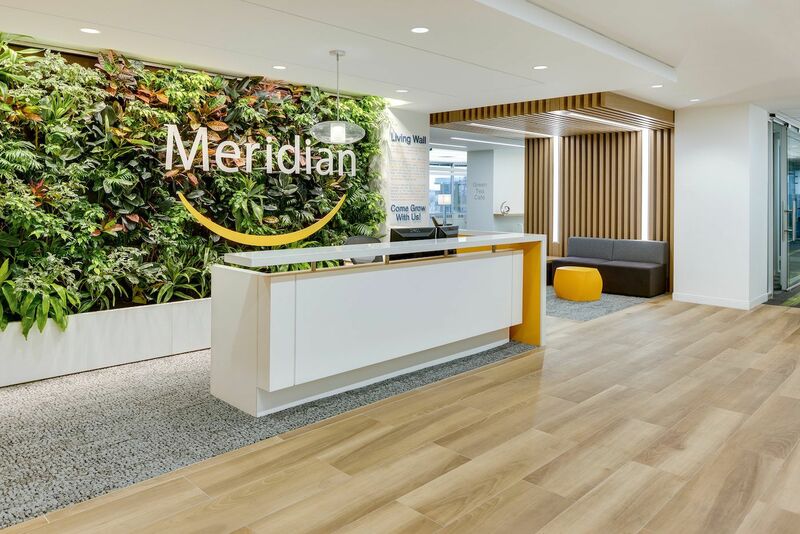 Meridian - Bullock + Wood Design Inc.
A vibrant and energizing space that supports the leadership teams’ strategic business objectives and the health and well-being of its employees. Tea areas were designed as quiet working spaces or meditative areas. At any given time, employees can be found comfortably seated near the fireplace sipping a drink or working on their laptops. Meridian, Ontario’s largest credit union, relocated its corporate office from the downtown core to the west-end of Toronto. The new 32,000 sq.ft. 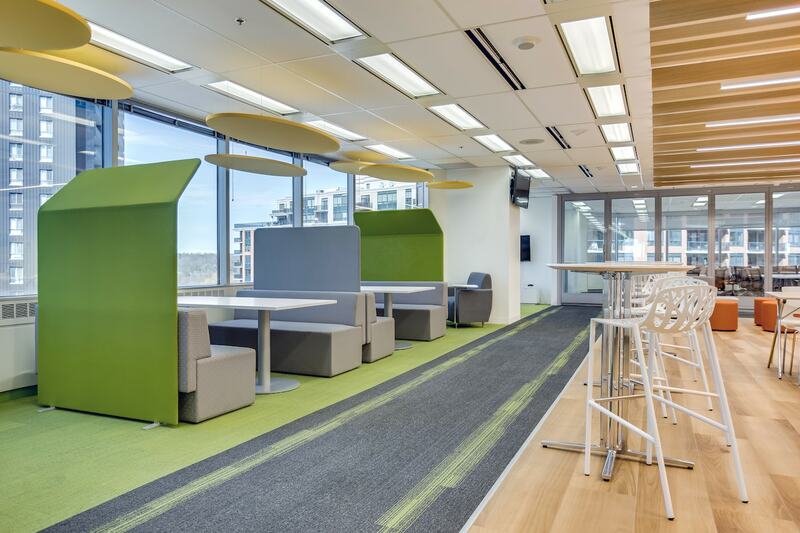 workplace has access to 360° of views with the tree canopy, visible from the south and west sides of the floorplates. 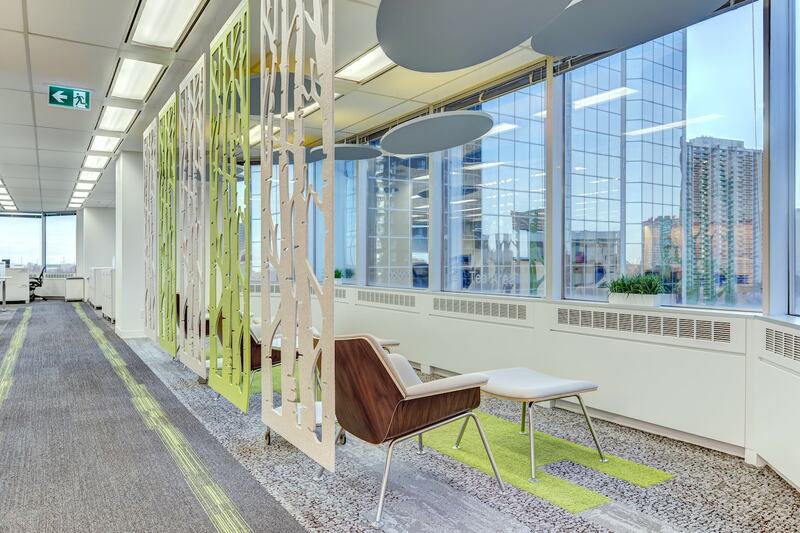 This served as inspiration to bring the outdoors in. 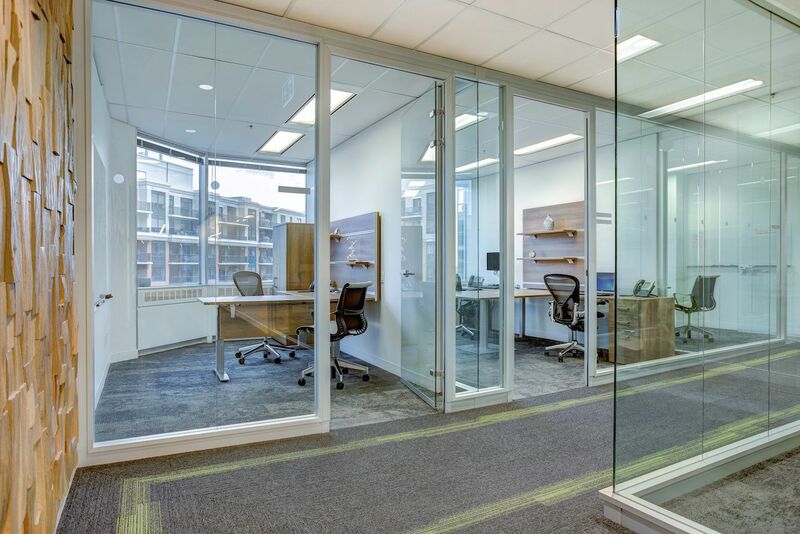 Biophilic research has proven that people feel healthier, more productive and creative when surrounded by natural light, indoor plants, quiet working spaces, view of the water and bright colours. 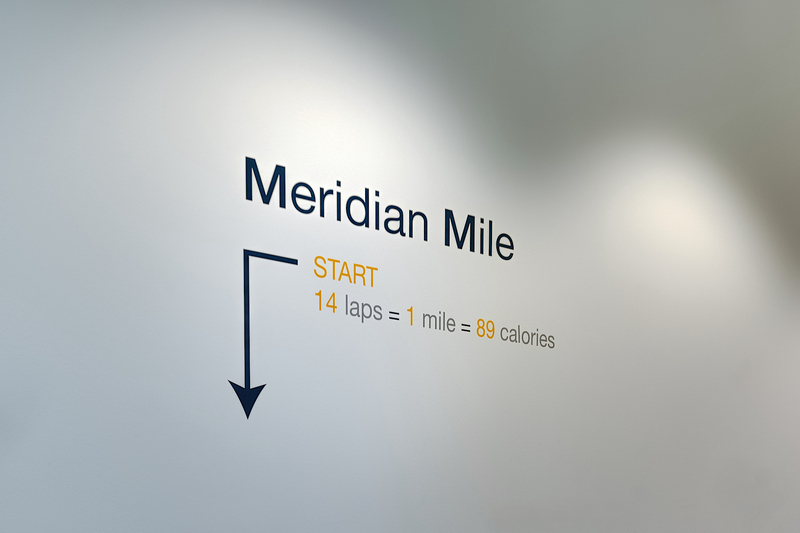 We introduced these principles into the design of Meridian’s new workplace. The best views were allocated to staff workspaces and we placed collective spaces in areas with less desirable views. 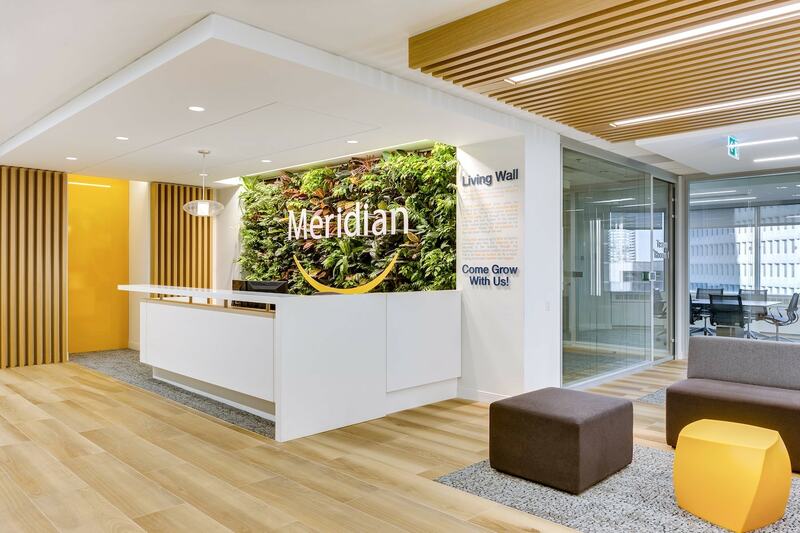 The Welcome Centre greets guests and staff with a lush green living wall surrounding Meridian’s signature “smile”. A pergola-inspired slatted wood structure, wood-like tiles and an assortment of carpets with biomimicry designs were specified to enhance the outdoor feeling. 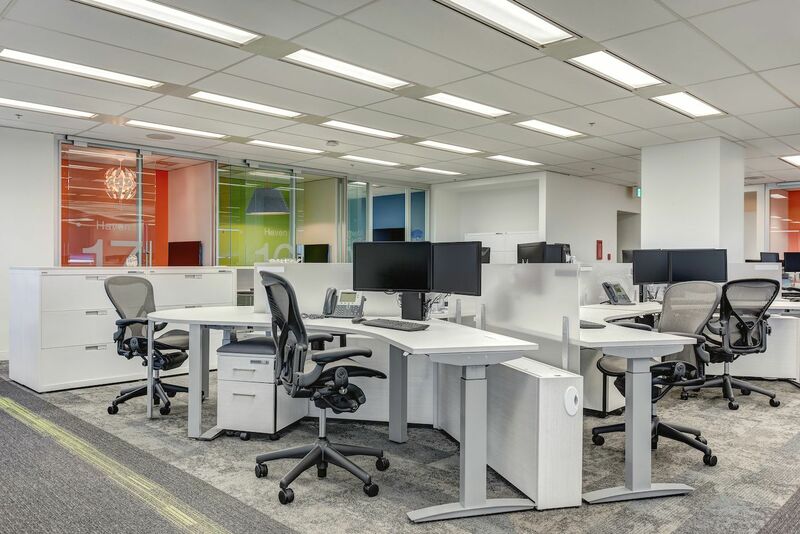 Collective spaces dot the workplace, where employees can choose the environment most conducive to the tasks they are performing. 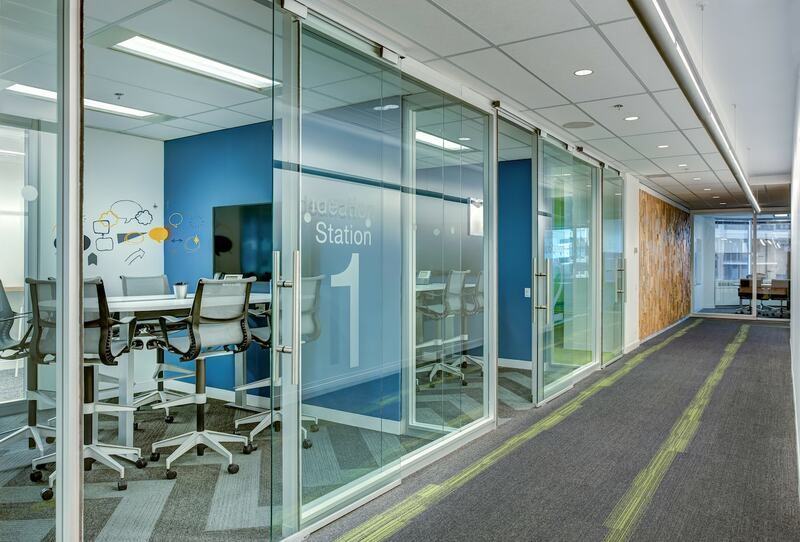 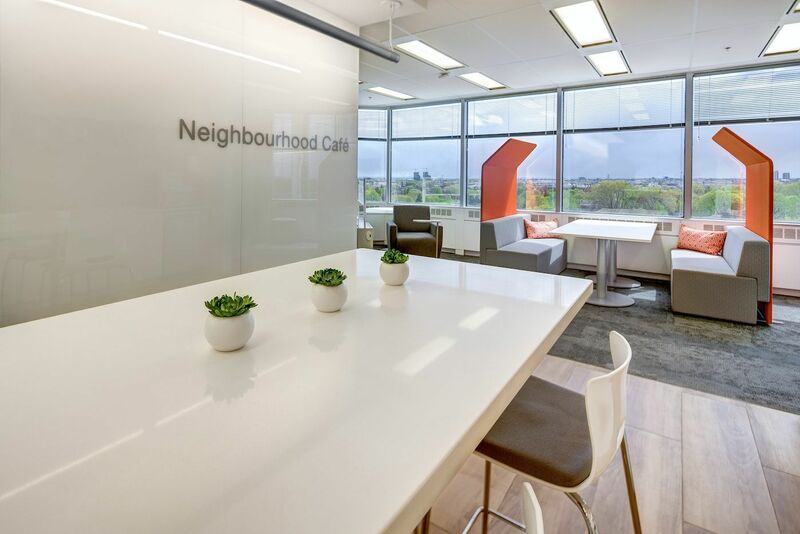 Glass walls allow for design elements to pop and showcase exciting work happening, enhancing a collaborative culture. 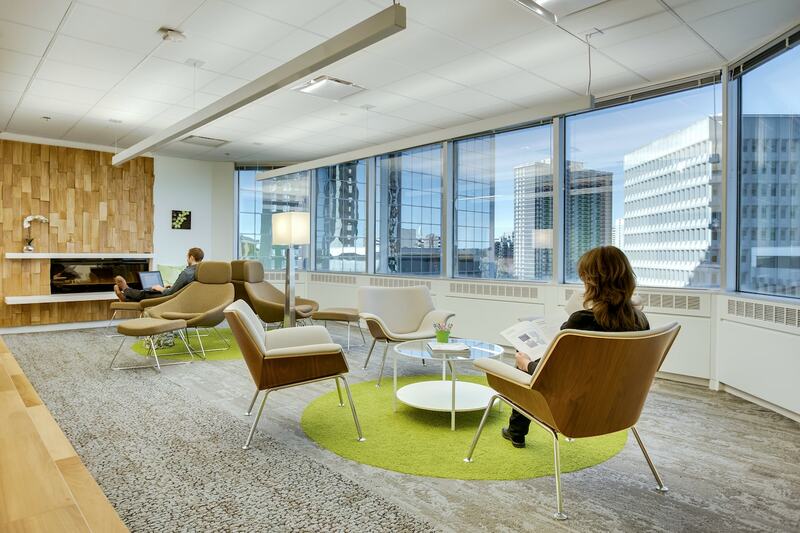 The open Plaza is a place for employees to congregate, refresh, rejuvenate and host town hall meetings. 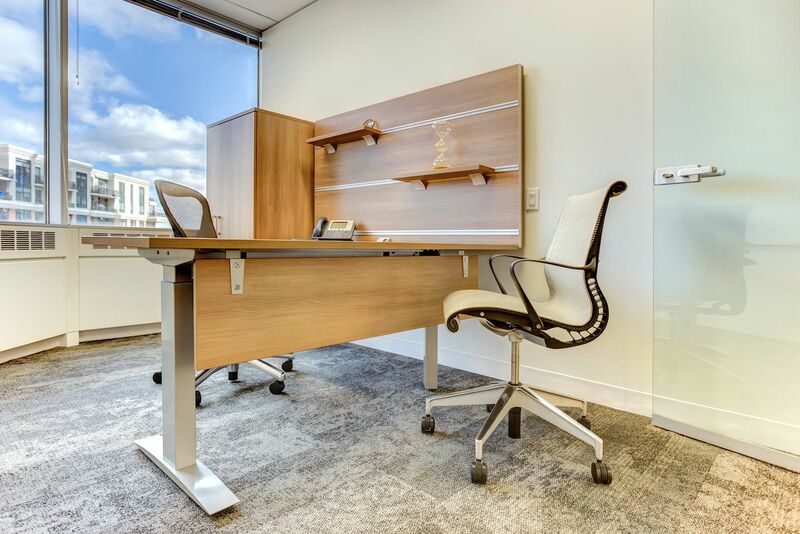 The workplace features sit/stand desking for all employees and the surrounding windows provide natural light and breathtaking views of Lake Ontario. 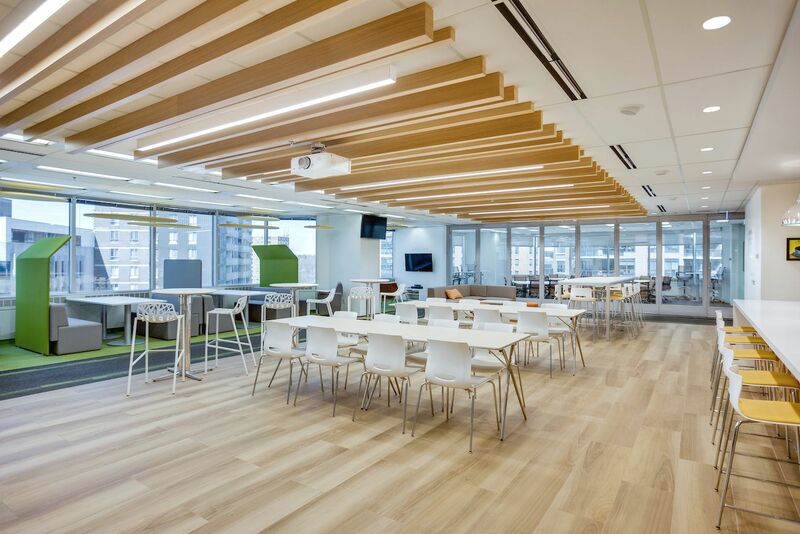 Coves were strategically placed by refreshments. 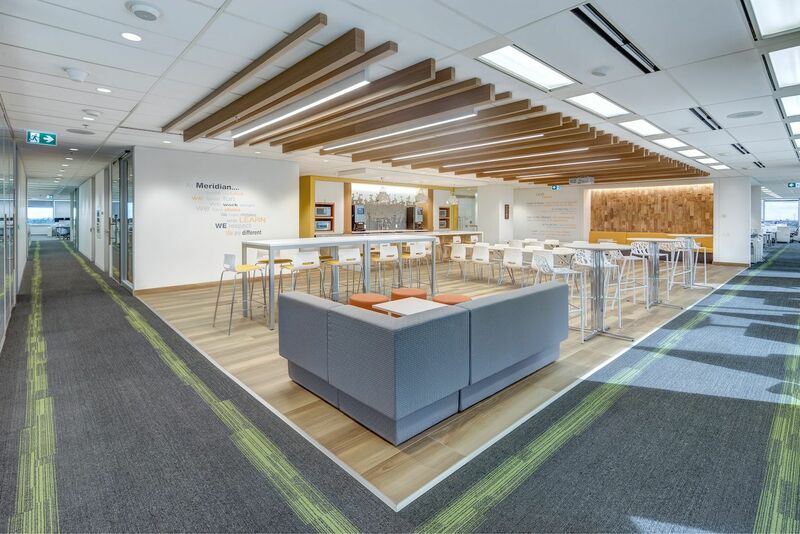 A walking path, known as the “Meridian Mile”, wraps each floorplate and we emphasized the pathway to emulate a walk in the park through colour, pattern and texture. 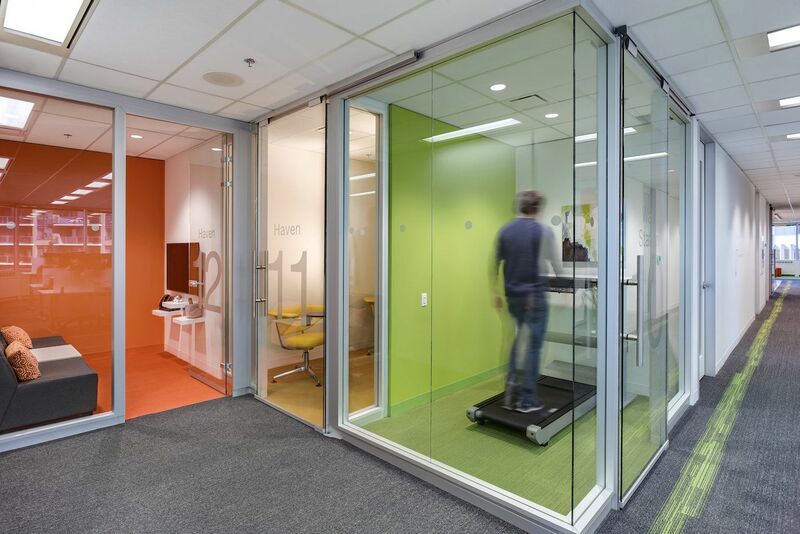 To further assist in reaching 10,000 steps, each floor has an enclosed walk station.